(Eastlake, OH) - The Lake County Captains, Class-A Affiliate of the Cleveland Indians, have announced their expected 2019 Opening Day roster. The Captains will open the season with seven players who rank among the top 30 Indians prospects, according to MLB.com, five of whom are still teenagers. Lake County will also include three first round picks. Seven top prospects are expected to headline the Captains' roster on Opening Day: SS/2B Tyler Freeman (#3), C Bo Naylor (#4), RHP Luis Oviedo (#8), 2B/SS Jose Fermin (#23), OF Will Benson (#25), OF Quentin Holmes (#27) and SS Marcos Gonzalez (#28). Freeman, Naylor, Oviedo, Holmes and Gonzalez are all still 19 years old. Fermin and Benson are still 20 years old. Freeman: The 19-year old middle infielder was the 71st overall selection in the 2017 draft, selected by Cleveland in the Competitive Balance Round B that year. Freeman was an All-Star with the Mahoning Valley Scrappers last year and won the New York-Penn League batting title with a .352 average. Defensively, he played 52 games at shortstop and 10 games at second base last season. Naylor: The Indians made Naylor, a catcher from Mississauga, ON, their first round pick last year (29th overall). Recognized as "one of the best pure hitters among high schoolers in the 2018 Draft" by MLB.com, the left-handed hitting Naylor made his pro debut in the Arizona League last year and.274/.381/.402 as an 18-year old. His older brother, Josh, was also selected in the first round back in 2015 by the Marlins. Oviedo: Oviedo returns to Lake County after a brief, two-game cameo at the end of last season. Prior to that, the Venezuelan right-hander tore up the New York-Penn League with a 1.88 ERA and 61 strikeouts against just 10 walks. Oviedo also set a new Scrappers single-game strikeout record with 12 punch-outs against the West Virginia Black bears on June 28. Fermin: Another youthful middle infielder, the 20-year old Fermin ranked among the league leaders in several offensive categories last year. He posted the league's lowest strikeout rate (8%), finished second in walks (39) and owned the fourth-best on base percentage (.391). Fermin played 37 games at second base last year, 22 at shortstop and four at third base. Benson: Cleveland's first round pick in 2016 (14th overall) returns to Lake County for the second season after leading the Midwest League with 22 homers last year. The 2018 Midseason All-Star also finished second in the league's home run derby and ended the year with the third-most walks in the circuit (82). Holmes: The Indians made Holmes, a known speedster, their first selection in the 2017 MLB Draft (2nd round, 64th overall). The right-handed hitting outfielder has been awarded "80-grade" speed, the highest grade possible on the 20-80 scouting scale, and he was regarded as the fastest player available in his draft class. Holmes missed most of last season due to injury, but has played in 48 games in the Arizona League across 2017-18, his first two pro seasons. Gonzalez: Gonzalez may be just 19, but already has two professional seasons under his belt. 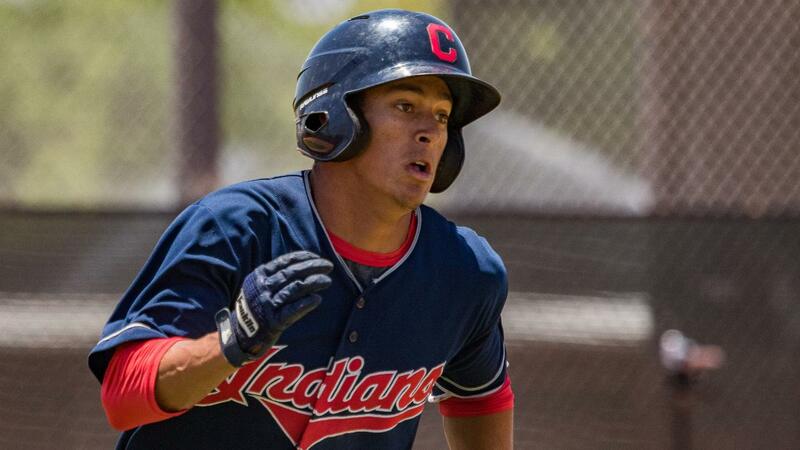 After signing with the Indians in 2016, the shortstop made his pro debut in the Dominican Summer League in 2017 and made the jump to the Arizona League last year. Last season, the youngster hit .305/.397/.458, all of which were improvements from his 2017 numbers. Lake County's Opening Day roster features three of the Indians' recent first-round selections. In addition to Benson (2016) and Naylor (2018), LHP Brady Aiken (2015) will return to the Captains after pitching for Lake County in 2017. The 22-year old southpaw is not only a former first-round pick, but a former first overall selection. Aiken was originally drafted with the #1 pick by the Houston Astros in 2014, but did not sign. The Indians then selected Aiken in the first round the following year (17th overall). Aiken pitched in 2017 for the Captains, but did not play for a minor league club last year. He went 5-13 with a 4.89 ERA for Lake County two years ago. The Captains' pitching staff features 13 arms, including seven who will be returning to Lake County: Aiken, Oviedo, RHP Manuel Alvarez , LHP Skylar Arias , RHP Dakody Clemmer , LHP Zack Draper , and RHP Thomas Ponticelli . The remaining six pitchers will be newcomers to the Captains: LHP Raymond Burgos , LHP Eli Lingos , RHP Shane McCarthy , RHP Juan Mota , RHP Aaron Pinto and RHP Alex Royalty . As the Indians' first-round selection last year and Cleveland's #4 prospect, the 19-year old Naylor headlines the Captains' trio of catchers. He'll be joined by one backstops who returns to Lake County and one newcomer. Josh Rolette played in 56 games for the Captains last yea and hit .253/.360/.388. Angel Lopez played most of last year with Mahoning Valley and had a six-game cameo with High-A Lynchburg. Lake County's infield features three top 30 prospects in Fermin, Freeman and Gonzalez, all of whom are under 21 years old. The Captains will also welcome back two members of last year's team in Jesse Berardi and Ulysses Cantu . Berardi played in 69 games for Lake County in 2018 and hit .234/.290/.333, while playing second base and shortstop. Cantu began last season as the Captains' starting first baseman. The now-20-year old held that role until early July, when an injury caused him to miss the rest of the season. Hosea Nelson , Mitch Reeves and Ruben Cardenas round out the Captains' outfield core with top prospects Benson and Holmes. Nelson delivered a breakout 2018 season with Mahoning Valley, earning New York-Penn League All-Star honors and winning the league's July Player of the Month Award. Reeves returns to Lake County after finishing 2018 with the Captains. Prior to his 12-game stint in the Midwest League, Reeves was also a NYPL All-Star and hit .274/.349/.384 with Mahoning Valley, playing both outfield and first base. Cardenas began his pro career last year after the Indians drafted him out of Cal State Fullerton in the 16th round. He played 37 games in the Arizona League and five with Mahoning Valley, hitting a combined .308/.414/.455 with 15 doubles. The Captains open their 2019 season at home on Thursday, April 4 at 6:30 p.m. against the Great Lakes Loons, Class-A Affiliate of the Los Angeles Dodgers. Individual game tickets, affordable ticket packages and group outings are available for purchase now. More information may be found at www.Captainsbaseball.com and by phone at 440-954-WINS (9467).